It’s a busy week of action in the Premier League with not just one, but two sets of games to look forward to. Matchday 24 gets underway on Tuesday and is completed on Wednesday night and then at the weekend, from Saturday through to Monday we will see all the games in Matchday 25 completed, providing that the weather doesn’t intervene in matters. The top two, Liverpool and Manchester City will be looking for six points from their two games over the period with the Reds taking on Leicester at Anfield on Wednesday night and following that up with a tricky trip to West Ham on Monday evening. City in contrast play Newcastle United away from home on Tuesday night before facing Arsenal on Sunday afternoon at the Etihad. It is going to be interesting to see if Ole Gunnar Solskjaer can continue his run of eight wins in a row since taking over at Manchester United. The Red Devils have a very winnable home game with Burnley up first but then face a tricky trip to Leicester on Sunday afternoon in what should be a good test for the United boss. There’s also plenty of key games taking place at the bottom of the table too with Southampton facing Crystal Palace on Tuesday and then on Saturday Burnley face Southampton and Crystal Palace take on Fulham, while Cardiff have a must-win home game against Bournemouth. As always, if you fancy a flutter on the games this week in the Premier League, then bet365 Sport is the place to head. New customers can sign up with the latest bet365 New Player Promotion, which could see you earn up to £100 in bet credits once you are up and running on the site. 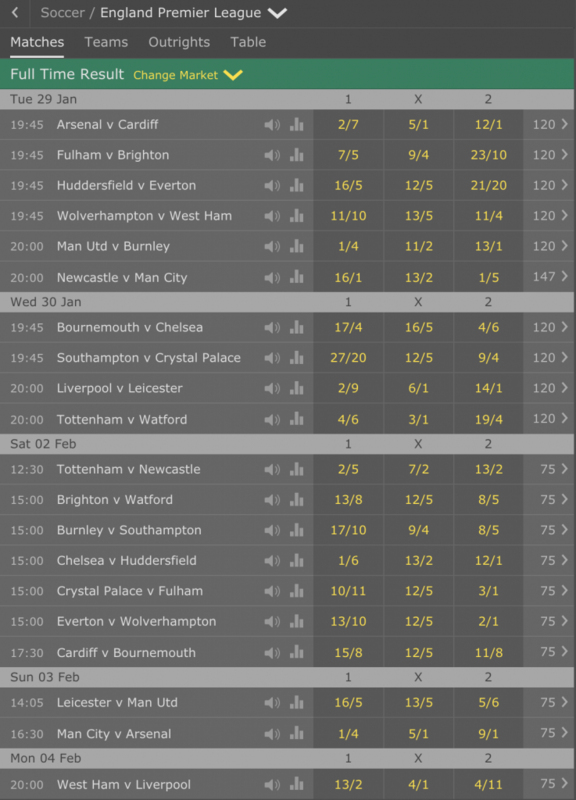 Lets now take a closer look at the two sets of games coming up in the Premier League this weekend, with the odds from bet365, correct as of 2pm on Monday 28th January 2019. As you can see, we haven’t really gone crazy with the tips for the midweek games. We’ve backed all the top six to win their games as I feel their opponents are not quite strong enough to challenge their dominance. The most interesting option for me is the Fulham v Brighton game, which I think could go any way, but I feel that a draw is most likely, although that result would be better for Brighton than Fulham. The other game to watch in midweek is Southampton v Crystal Palace which is another game that could go any way, but which I feel that the Saints, who have been steadily improving at home and who beat Palace away earlier in the season, will feel that they have a great chance to get maximum points from. Huddersfield don’t score very many goals, especially at home and against an Everton side that have been better defensively than in attack of late, I think the home side may well struggle again. I can’t see many goals in this game and if one team is to score, I imagine it will be the Toffes. I’d back Everton to win and both teams to score – No here, or you could get the better odds on a Correct Score pick with Huddersfield 0-1 Everton being a 6/1 chance. Wolves have been very solid against the better sides in this division and they earned a last gasp win away to West Ham earlier in the campaign. The Hammers form is very erratic and although they may have Marko Arnautovic back, I still feel that this is another game where they will struggle to break down Wolves defence and I think a single goal may be enough for the Wolves win, hence this pick for my second bet. The big game at the weekend comes at the Etihad where Manchester City will be confident of getting one over an Arsenal side that have not been at their best against the bigger sides in the Premier League this season. City are in great form heading into this game and as such, they should run out comfortable winners I feel. Other intriguing games include Burnley facing Southampton, in what should be a cracking relegation battle as should Palace by Fulham and in both those games I feel that home advantage should be the key to securing the points. 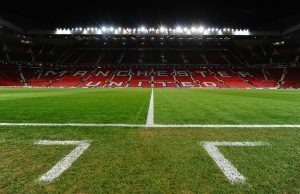 Manchester United face a tricky trip to Leicester in what should be a good test of Ole Gunnar Solskjaer’s team, while the league leaders are in action on Monday night as they face what looks like a tricky trip to West Ham United. I really fancy this game between a strong Brighton side at home and against a Watford side that do blow hot and cold but who have been in relatively decent form of late, will be a draw and I think that with neither side scoring too many, nor conceding a huge amount, that this will be a low scoring draw. 0-0 was tempting but I think both sides have enough quality going forward to find the net once apiece. There’s no doubt that Manchester United are a far better team now than they were under Jose Mourinho and their improved form is clear indication of that. However, Leicester are no mugs and in Jamie Vardy they have a striker who has a superb record of scoring against the top sides. 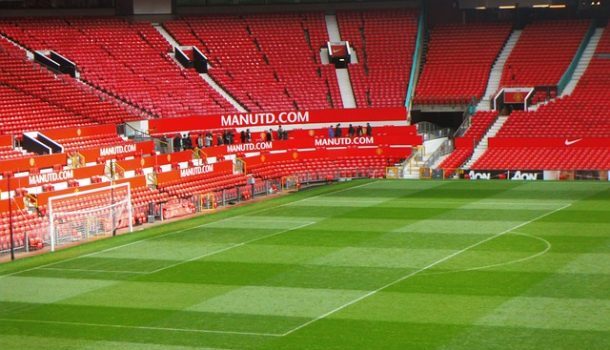 I still fancy United to win, but I also feel Leicester will find the net to make a real game of it. As the Asian Cup Hots Up Why Not Tune into The Action and Have A Bet at Bet365?